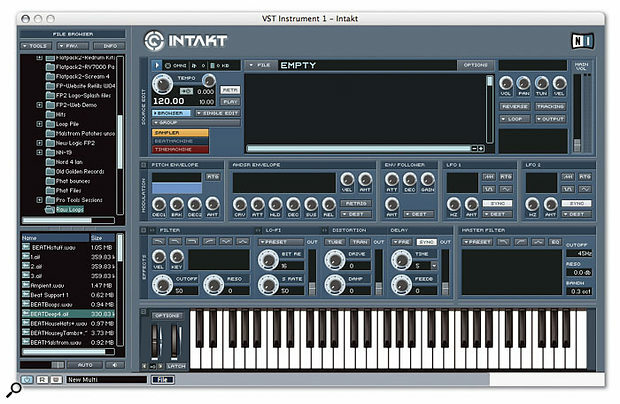 Intakt is the third member of Native Instruments' Holy Trinity of samplers, the other two being Kontakt and Battery. Kontakt is the 'daddy' full-featured sampler package, while Battery is a sophisticated sample-based drum machine. Intakt lays claim to different territory, being a dedicated loop tool. There's been quite a resurgence of loop and beat-slicing software of late, probably spurred on by Reason 's Dr. Rex loop player. Plug-ins like Phatmatik Pro and Beatburner are appealing to a whole new wave of desktop music producers who want to create something new from loops, rather than just slot together library material. So what does Intakt have to offer to make it stand out from the crowd? Well, for a start, as far as I'm aware it's the first of its kind to combine Recycle-style beat slicing with granular time-stretching of the kind available in Live and Acid. Before we get stuck into specifics, what exactly is Intakt for? Well, it has as number of uses, but at the simplest level it loads sampled loops and plays them back in time with your sequencer. Intakt has three distinct methods of achieving this, all of which are possible in various other samplers, but are packaged together here in a unit dedicated to the task. Two of the available methods (or sampling 'engines') can alter the tempo of the audio loop without affecting its pitch, and vice versa. As well as simply playing back samples, Intakt can manipulate, modulate, rearrange and otherwise mess with the loops loaded into it. As its raw material Intakt can read standard audio files in most formats as well as Recycle (REX/RX2), Kontakt, Battery, Akai, EXS, LM4 and Soundfont 2 files. As such it makes a very good access point to the majority of loop libraries, and has in fact been adopted by some sample CD manufacturers as a supplied front end (see ' Intakt Instruments ' box). Intakt itself comes with a 1.2GB library of loops picked from Zero-G's and East West's catalogues. Like all NI software, Intakt supports a wide range of formats. It can run as an Audio Unit, VSTi, DXi and RTAS plug-in, and can also run stand-alone using ASIO, Core Audio or Direct Sound. The installer lets you choose which plug-in formats you want to use, or you can install all of them. You then have a 30-day grace period to handle the registration and copy protection procedure. A separate registration tool application gets installed with Intakt, which generates a machine-unique challenge code to be sent to NI. If your studio computer is on-line this happens instantaneously, otherwise the utility generates a file that you can email from another machine. When you get the response code, you run it through the registration tool again and your machine is authorised. After having a good play with the factory sounds (see the 'Loop Pool' box) using Intakt in stand-alone mode, I decided to get stuck in with one my own loops. As I've already mentioned Intakt gives you a choice of three options for handling each loop: Sampler, Beat Machine and Time Machine. I thought I'd try them all with the same loop. I wanted to use the RTAS plug-in version with Pro Tools but this wasn't working at first, so I fired off an email to NI's support and switched to Cubase SE. If you tell Intakt the length of your loop in bars and beats, it will calculate the tempo.As you'd expect with a plug-in, everything is presented in one window, divided into modules as in Kontakt. 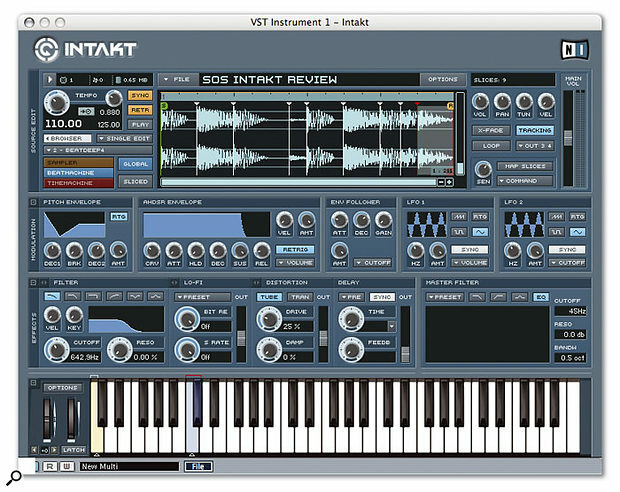 Native Instruments have standardised much of their line, Intakt included, with a proprietary file browser that slides out to the left of the window. The top pane displays the directory hierarchy of your drives, while the bottom lists the readable files in the highlighted folder. While this is a little fiddly at first, it does ensure consistency between Mac and PC, and will also be familiar to Ableton Live users. The browser also features a format filter, user favourites directories, and an audition system. Double-clicking my loop loaded it in, displayed the waveform in the Source Editor module (the top section of the window) and assigned it to the first MIDI key for playback. Alternatively, samples can be dragged from the browser onto the keyboard display to choose the key mapping. When doing this you can position the cursor higher or lower above the keys, and a coloured range indicator lets you spread the sample over several keys. When first loaded, a loop defaults to being handled by the Sampler engine, indicated by the orange button at the left of the Source Editor. This operates like any traditional sampler, pitching the sample up and down to adjust the playback speed and vice versa. The sample can be pitched over several keys by adjusting the red range marker above the keyboard, with the root key (original speed) being set by the white triangle beneath. So far, this is pretty normal, and of little interest to us as far as looping is concerned! Much more important are the tempo and sync'ing controls located to the left of the waveform display. The larger of these two dials indicates the master tempo, and is locked when you are running as a plug-in because it's sync'ed to the song's tempo. The smaller dial is the playback speed of the selected sample, measured as a ratio against the loop's original tempo. Critically, this can be locked to the master tempo, ensuring that the loop is automatically in sync with the song. However, before this can work you need to tell the software how long the loop is in bars and beats. Pressing the small clock icon between the dials opens up a window for setting sync options. From here you enter the loop length, from which Intakt will derive the original tempo. A retrigger length, combined with the Retr button on the main panel, will start the sample from the beginning at each loop length, avoiding any tiny length error accumulating over time. From now on, the assigned MIDI key will run the loop in time with the song. Anyone who's sync'ed up a loop sample on a traditional sampler will appreciate how much time's just been saved, and we haven't even got to the really clever stuff yet! As you can probably see from the display, you can set in and out locators, and also specify a separate loop zone for looping a second portion within the main sample. If there a loop is written in the original file by a separate editor like BIAS Peak, this will transfer to Intakt. Mac: Mac OS 10.2.6 or higher, 500MHz G3 or better CPU, 256MB RAM. PC: Windows XP, 500MHz Pentium III/Athlon or better, 256MB RAM. While the Sampler engine has the advantage of automatically pitching the sample to sync with the song, it still suffers from the fact that pitch is inextricably tied to speed. That's where the Beat Machine and Time Machine engines come in. Beat Machine uses the trick of 'beat slicing', which will be familiar to users of Recycle and REX loops. This method chops the sample up into slices, and achieves tempo adjustment by sliding them apart, or closer together. The technique only works transparently on rhythmic drum and percussion loops, or music broken into staccato transient hits or notes. Note that an Intakt patch (or 'instrument' in NI-speak) can have lots of different loop samples spread across the keyboard, using a mixture of engines. The keys are colour-coded, with Sampler-based loops in yellow, Beat Machines in blue and Time Machines in red. Beat Machine is designed to detect individual hits within a drum loop and slice it up accordingly. As you can see from the screen shot, the sample is analysed and white lines appear in the display, marking where Intakt thinks the individual hits of the drum loop occur. The Sen dial to the right of the waveform display adjusts detection sensitivity, generating more or fewer beat markers. You can play back each slice individually by clicking it in the display, revealing where you need more slices. With my loop, pushing up the Sen a little got everything except for one quiet hit in the last slice. Pushing any further resulted in lots of 'false alarm' markers appearing all over the place. At this point you have to bring the sensitivity back down a bit and manually add what's missing. To do this you zoom in and find the peak in the waveform, then right-click (or Ctrl-click on the Mac) to add the slice. Slices can also be nudged earlier or later. This brings me to my biggest gripe about Intakt: you can't adjust the size of the waveform display. The display is way too small for comfortable editing and really slows you down, especially if you're used to using Recycle to do the same task. However, it gets the job done in the end. 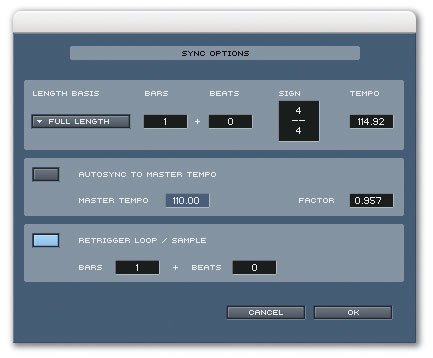 As with the Sampler, the loop and retrigger lengths must be entered in the sync options panel. Now when you play back, the loop is in sync, but this time the original pitch is preserved. At first, the whole loop is assigned to one MIDI key, and can be played back by a held note in the sequencer. This feature makes using beat-sliced loops particularly quick and simple in Intakt. By widening the range of keys assigned to the loop, you can adjust the pitch of the loop, without changing the tempo. Traditionally, beat-slicers assign each slice to a different key, with the loop triggered by a MIDI sequence that steps through the keys. This gives the extra flexibility to re-sequence the loop (or strip parts out) by editing the MIDI notes, and is possible in Intakt by switching from Global to Sliced edit mode. As soon as you enter Sliced mode a window pops up with options for mapping the slices to individual keys (left). As well as key mapping, the window provides a few other options, including adding short start and end fades to smooth playback, and artificially stretching the end of each slice. The 'end stretch' smooths playback when you reduce the tempo, filling the gaps that are left as the slices move apart in time. Various options are available for mapping the slices of a loop to MIDI notes.In Intakt, stretching is achieved by introducing back-and-forth looping over the percentage of the loop specified in the option box. I found this technique very successful for slices containing smooth audio at the end. Inevitably it doesn't work so well for erratic audio. One shortcoming of Intakt is that to change the stretch percentage you have to go through the slice mapping process again, losing any subsequent editing from the previous time. The last option in the mapping box is to export a Standard MIDI file that will play back the slices in their original order (and can be edited to change the loop). The resulting file is imported into a sequencer track. This works fine, although I'd have liked a quicker method, such as that in Reason, where you can dump the MIDI directly into a track. It's nearly always worth mapping the slices, even if you don't use a MIDI file, as it lets you alter each slice individually in the modulation and effects sections. Additionally it lets you sequence the slices in any order via the keyboard. However, Intakt has another method of rearranging slices, while still playing back the loop from a single key. The top right of the window has a slice order pop-up, where you can switch the position of each slice in Intakt 's internal playback sequencer. There is also a slice order randomise function in the Command menu, which is lots of fun and can quickly transform your loops into something unexpected. 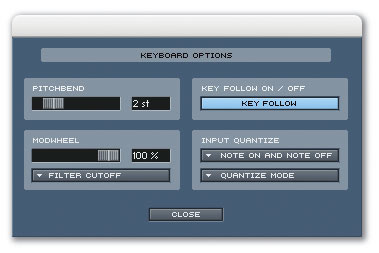 The keyboard quantise options allow you to trigger loops exactly in time from the keyboard. One thing that kept occurring to me was that Intakt would make a good live looping station. The fact that you can run it stand-alone, with multiple loops spread across the keyboard, and using different looping methods for each, sets it apart from the competition. Also, within a patch you can split off each sample to different outputs. MIDI Controller mapping is implemented: Command-clicking (or Ctrl-clicking on PC) opens up a controller page, and all you have to do is wiggle the desired input device and it gets learned. 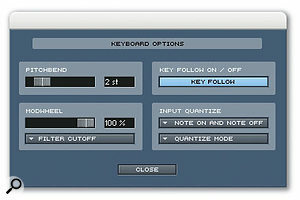 Intakt 's best live tricks, though, are the keyboard quantise and latching functions. The quantise function lets you start your single-key loops and samples exactly in time, based on your choice of time division. For example you can set it so that loops will only start or stop at the nearest bar to your key press, while smaller divisions let you offset loops but stay in sync. The Latch function keeps a key held down until you press it again, so you can quickly switch loops on or off. Unfortunately, on my system Latch only worked from the on-screen keyboard, whereas you really want to use it from your MIDI keyboard. However, Intakt does use the standard Native Instruments trick of turning your computer keyboard into a playback device, and Latch does work with this, so all you need is your laptop! Chances are that if you mainly use drum and percussion loops, most of your work will be in the Beat Machine. However, there are limits inherent in the method, as many loops will not sound right when chopped up and tempo-adjusted. For example, in my example loop the last few slices have hits that overlap, and the sound breaks up when slowed down. The final trick up Intakt 's sleeve, Time Machine, can overcome these problems, and works with any kind of material, including vocals. This engine uses granulation, or granular resynthesis time-stretching, to give it its full name, to fit samples to the tempo. This technology also gives you separate control of pitch with respect to speed. It's the same technique used by Acid and Live to 'warp' audio. The Time Machine sampling engine uses granular resynthesis time-stretching to manipulate the tempo and pitch of a loop independently. As before, Intakt needs to know the length of the loop, but after that no further preparation is needed for tempo-sync'ed playback. The sample's playback speed is automatically adjusted to stay in tempo. As with the Sampler, the key range can be extended so that you can play back at different pitches, but this time the tempo is unaffected. Although this is bound to be the most common way of using the Time Machine, you are free to switch off tempo sync, and play with the speed controller to create some mental-sounding granular synth-style effects. In fact, loops aside, I found Intakt really useful for playing back long pad and atmosphere samples at different speeds. The Legato option means all keys will lock to playing the same point in the sample at any time: nice! Obviously, Time Machine is not a miracle worker, or else you would use it for everything. The tempo cannot be changed too drastically or the sound begins to suffer, sounding 'grainy' or 'burbly'. The usable limit varies depending on the type of sound. I found that most material, including drums, could be adjusted by up to 10 percent without too much trouble. Some sounds are more amenable to the scheme: for example, I found that some analogue synth loops that sounded perfect right down to half their original speed. The Source Editor contains a grain size setting, which optimises the algorithm for different material types, although it's not labelled as such and the manual makes no mention of it or how to use it! There is also NI's ingenious Transient Copy function available (from the TRC button and TRS knob), which seriously improves the quality of drum and percussion loops when stretched. Like the Beat Machine, TRC detects transients and tries to preserve their integrity during playback. This stops drum hits from being 'granulated' and sounding crumbly, as isoften the case with this kind of technology. I tried it on a number of things and it really works: I reckon it doubles the usable tempo range for drum loops. The 1.2GB sample library included with Intakt is packed into two files containing the audio data and a folder of programmed patches ('instruments'). If you use this folder for your own instruments you can load them from the patch selector, without having to wade through the main file browser. By my reckoning there are over 1000 patches split into 10 categories. Most of the further subcategories have a master patch called, for example, 'All Breakbeats', which has all the main loops mapped out across the keyboard on one key each. This is incredibly useful when browsing through the samples. Once you think you've found what you want you can load the main instrument for that loop, which will have more sophisticated, key-mapped patch programming. As for the content, there is of course a broad variety, mostly of pretty good quality. Strangely, the first set of drum loops has the least successful beat-slicing — you'd think that they would want to start off the list with something really good. Luckily, it gets better quickly. On the whole, sensible choices have been made for which engine to use for each sample. As expected, the majority of the drum-based loops use the Beat Machine option, switching to Time Machine where slicing is inappropriate. It doesn't sound as though many of the programmers got into the end-stretching function, because most sliced stuff gets gappy when slowed down. Many of the 'keyboard' loops really need sorting out, having been saved with strange bar lengths and tempos that don't work at normal speeds. However, there are some outstanding highlights, such as the orchestral loops section. These are all short ensemble phrases from East West's Symphonic Adventures library, and could be described as 'movie scary bits'. Most of the percussion stuff will be useful, with the African percussion patches having been particularly well programmed. The sound-effects and ambient material is also quite inspiring. While the library is a welcome addition, and useful for seeing what's possible, I suspect most people are going to want to start mashing up their own loops straight away. While you can mess around with samples a fair bit in the source editor, more sound-shaping possibilities can be found in the modulation and effects sections of the plug-in. As you can see from the screen above, you get an AHDSR envelope generator, an envelope follower, and two LFOs, all of which can be assigned to different destinations. The pitch envelope is a highlight, especially with Time Machine, as you can mess up the whole loop without affecting the timing. The best fun with loops is being able to trigger envelopes at each hit, which is what happens with Beat Machine. In fact you can have different settings for each slice, so there's scope for much weirdness there. However, with the Sampler and Time Machine there are no slices, making the envelope follower essential for doing anything other than having envelopes triggered at the start of the loop. To be honest, though, it feels a bit restrictive: you really want two normal envelopes for beat-sliced zones, and two followers for the Time Machine. A compromise would be if you could send the envelope and follower to more than one destination at a time, but you can't do this either. I though I might be able to sync up the LFOs to use as pseudo envelope generators, but when Intakt is in Sync mode you can't set the LFOs to any subdivisions of time other than the loop length. The sampler functions are complemented by various modulation and effects options. Effects-wise you get multi-mode filter, lo-fi, distortion and delay modules. To be honest the filter is good, but the rest is nothing to shout about. Lo-fi is just a bit-depth and sample-rate reducer, which let's face it has very little scope. Rather than being fat and beefy, on most material the distortion is quite scratchy and thin. Overall, despite the nice pitch mod, and the thoughtful inclusion of the envelope follower, Intakt is a little underdeveloped on the sound-shaping front. There is certainly more fun to be had in close rival Phatmatik Pro, which has a versatile mod matrix, separate envelopes for everything and cool slice-looping options. Maybe NI will feel generous and include the Step Mod module from Kontakt in Intakt 2! Given Intakt 's ability to load just about every type of file format (including REX) it's not surprising that it's been picked up by East West, Zero-G and Best Service to act as the front end for several of their sample loop libraries. 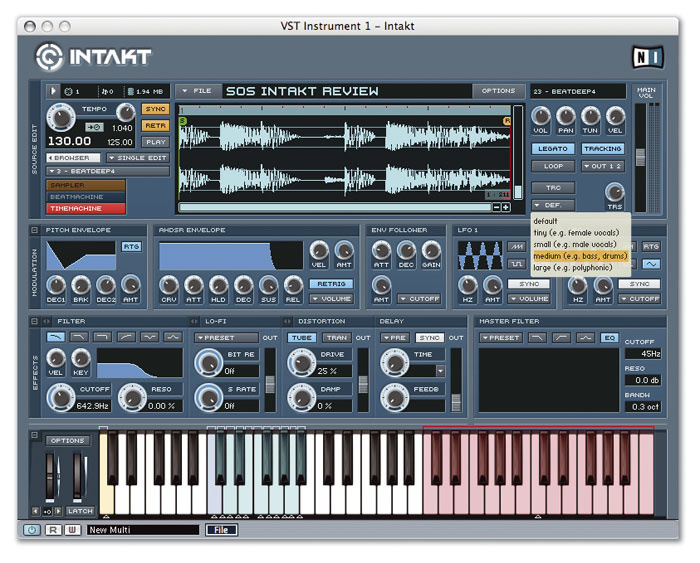 These libraries ship with a version of the sampler called Intakt Instruments, which has all the functionality of the full version but can only load the loops that make up the library. The built-in file browser is absent and you simply load samples from the bundle from the main patch selector. This kind of symbiosis makes a lot of sense, as the sample library is no longer limited to one format. What's more, the bundled player can alter and rearrange the loops so they can be reused, extending the use of the library. As a bonus, if you buy one of these libraries you get a discounted upgrade price if you later choose to buy the full version of Intakt. Intakt was very stable on my system running stand-alone and as a VSTi, although I never got to the bottom of why it wouldn't run on my Pro Tools LE system, despite quick responses from NI tech support. I did, however, use it with no trouble on another Pro Tools system, so I know it can be done. Performance was surprisingly good, even on my humble G3/800 Mac. Screen redraw dropped to a crawl in Cubase, but not in the plug-in itself, and came right back up when the plug-in window was closed. Sampler and Beat Machine are inherently low-impact processes, but even Time Machine didn't impose as much CPU load as I'd expected. The only major gripe I have other than the size of the edit window is the manual. It's very brief, misses a fair bit out, and on occasion alludes to things that don't exist! I have to admit that when NI started releasing different samplers I was a bit doubtful, thinking there would be too much overlap. However, I was proved wrong with Battery, and this is reaffirmed by Intakt. Intakt is not Kontakt Lite: it stands up on its own as a streamlined tool for getting a particular set of jobs done quickly and efficiently. Although Kontakt has the same sampling engines, and also has Intakt 's essential beat-slicing functionality, they are part of a more cumbersome whole, much of which is superfluous for running loops and certain other sample-playback jobs. There's also a certain financial flexibility: if Intakt does everything you need, or you already have a sampler, you can get your hands on NI's powerful looping tools at half the price of Kontakt. Plus, if you already have Kontakt you can get Intakt for half the normal price (just 99 Euros). But do you need it if you already have Kontakt? Well it does have advantages. Setting up the relationship between tempo and pitch, and how they sync to the master tempo, is really easy in Intakt, and the global and slice-based modulation options are all ready to go. Intakt extras also include slice order rearrangement, and quantised keyboard triggering for manually playing back loops in sync. As for comparisons with other products, other beat-slicing options come to mind, such as Phatmatik, or Recycle teamed up with a compatible sampler, but Intakt wins out for me with all its extra functionality, not least being the Time Machine's real-time tempo warping. However, the fixed waveform display means that you're still better off using Recycle to prepare your own loops before importing them into Intakt. On the whole, I can see Intakt becoming a core part of my set up, and if you're looking for something that has all the latest looping tools, I doubt you'll do better than this. 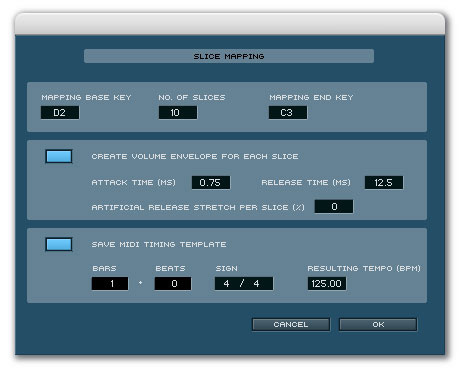 Beat slicing, granular time/pitch warping, and standard sample playback in one plug-in. Quickly syncs samples to the tempo of your song, no matter which 'engine' you use. Can read just about any format. Real-time sync'ing of loops played from keyboard. A lot of technology for your money. Can't resize the small waveform window so editing is fiddly. Modulation options and effects could be better. Probably the most sophisticated dedicated looping tool available, and the only one that combines Recycle-style beat slicing with granular time-stretching, Intakt has plenty to add to any of the hosts it can run in, and quickly becomes the first thing you reach for when bringing in loops of any format. £149.99; Intakt for Kontakt users 99 Euros; upgrade from Intakt Instruments 129 Euros. Prices include VAT.